Climbers on the western face of El Captain. Working together as a team they are able to reach a goal few are able to even dream of. I am about to reach all new heights on my blog for the month of June. 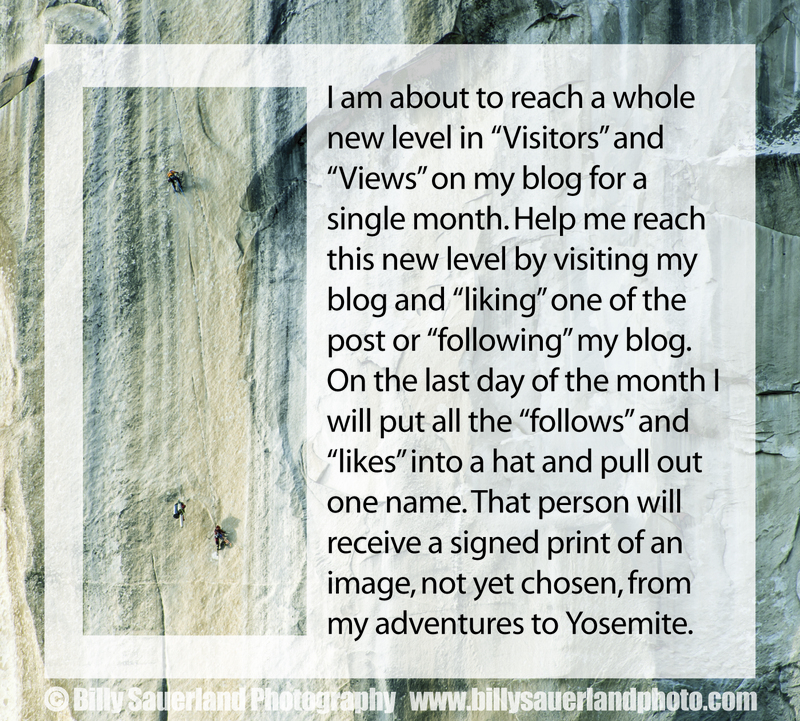 I am going to be doubling the “visits,” “views,” “follows,” and “likes.” I am wanting to see how many more I am able to get before the end of the month. So as an incentive I am holding a little contest. At the end of the month, I will put all the names of all the people that have “followed” my blog and “liked” any of the posts into a hat then I will draw one name. That person will win a signed print of one of the images, not yet chosen, from my recent adventure in Yosemite. So if you are reading this right now, click the “like” button below or the “follow” button above to be entered to win a signed print from me. ← Moon or not to Moon?